Theoretically, there are many choices for “F”, since the British army gives its armoured vehicles an FV designation. The Fox armoured car, for example, is more formally known as “FV721 Fox Combat Vehicle Reconnaissance (Wheeled)”. However, choosing something like “FV4034 Challenger 2” would have felt like cheating, so I’ve gone for the Fox. 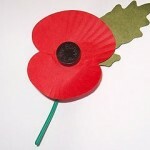 Introduced in 1973, it served with the British army for about 20 years. It has a crew of three (commander, gunner, and driver). The commander and gunner are seated in the turret, which is armed with a 30mm RARDEN cannon and a coaxial 7.62mm machine gun. The driver sits in the centre front of the hull. 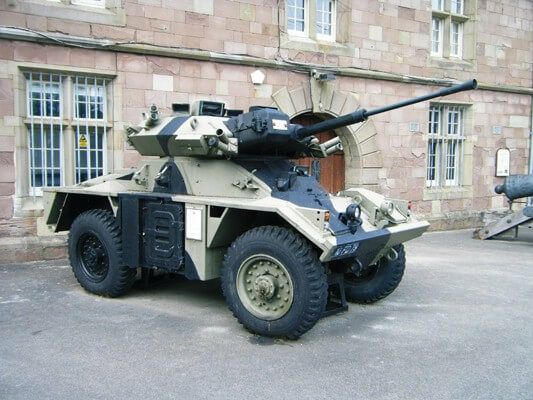 The vehicle has aluminium alloy armour sufficient to protect from small arms, but not from 0.50″/12.7mm HMG fire. The Fox can swim with the aid of a flotation screen, which takes about two minutes to erect, and can be dropped by parachute.